The first step in the construction of a recombinant DNA molecule is to isolate the vector and the fragment containing the gene to be cloned. The first step in the construction of a recombinant DNA molecule is to isolate the vector and the fragment containing the gene to be cloned. 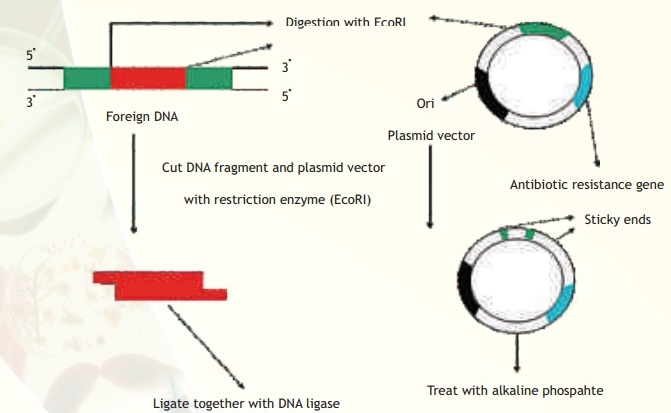 The vector and target DNA fragment are separately digested with the same restriction enzyme such as EcoRI which generates sticky ends. The vector is then treated with alkaline phosphatase enzyme so that later in the ligation step the vector does not self ligate. The cut vector and DNA fragment are mixed in a suitable ratio and then ligated with the enzyme DNA ligase to yield a recombinant vector containing insert. This procedure is schematically explained in Fig. 6.